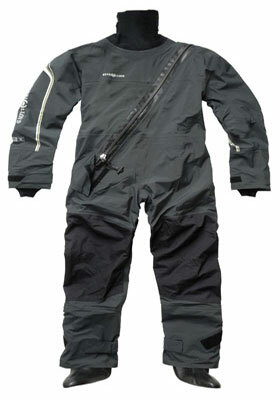 You Don't Have To Get Wet To Be A Sailor - Get A Dry Suit! The dry suit keeps you warm from the start, by protecting you completely from the water. As well as this, they enable you to where anything from thermals to a black tie suit underneath and never worry about it getting wet. They are what they used in James Bond films, when he comes out of the water, tears the suit off and walks into a banquet. They are made from plastics that mould around your body and are watertight. This is the major difference between a it and a wet suit. They are very easy to put on even when wet. Around the hand and neck is a neoprene like material that is still watertight, but allows you to use your fingers and to be able to see. So it isn't 100% body watertight, but it covers the most important parts of your body that needs to be kept warm. It has a inner plastic layer and an outer plastic layer. The inner plastic material covers your feet. It can be uncomfortable to wear sometimes, because since it is watertight it is also airtight. When you put it on there is still a lot of air left trapped inside. To stop this from happenning, you would take the neck neoprene like material and open it. Then bend your knees and try to push out as much of the air as possible. By the end of it the suit will cling to your skin and be less baggy. Very comfortable and looks stylish! I hope you can make up your mind whether or not to choose to buy one. They are best used in the winter months when the water is ice cold and you want it nowhere near your skin.